Halloween has come and gone, but this DIY voice changing Star Wars Stormtrooper helmet tutorial by [Shawn Hymel] is worth a look for a number of reasons. Not only is the whole thing completely self-contained, but the voice changing is done in software thanks to the Teensy’s powerful audio filtering abilities. In addition, the Teensy also takes care of adding the iconic Stormtrooper clicks, pops, and static bursts around the voice-altered speech. Check out the video below to hear it in action. Besides a microphone and speakers, there’s a Teensy 3.2, a low-cost add-on board for the Teensy that includes a small audio amp, a power supply… and that’s about it. There isn’t a separate WAV board or hacked MP3 player in sight. Part performance art and part social experiment, [mocymo]’s Smilemachine V6 helmet is as delightful as it is expressive. The helmet is made primarily from laser-cut MDF assembled around parts from a safety helmet. The display is an Android tablet with fine operation controlled by a Bluetooth mini keyboard, and the helmet cleverly makes use of the tablet’s ability to adjust the display to compensate for head tilt angle. It recently made an appearance at Maker Faire Tokyo, where the creator says the reception (especially by children) exceeded expectations. There are several interesting things done with this device. One is the handheld controller, which is essentially a mini Bluetooth keyboard. To help allow fine control without needing to look down at the controller, the keyboard sits in a frame with some nuts and bolts used as highly tactile button extensions. By allowing the user to change the physical button layout (and setting up keyboard shortcuts on the device to match) the arrangement can be made more intuitive for the user. Some photos of this assembly are in the gallery after the break. Geared mirrors to allow seeing out the front of the helmet. Another interesting bit is that despite a tablet being right in front of your eyes, it is possible to see out the front of the helmet while wearing it. 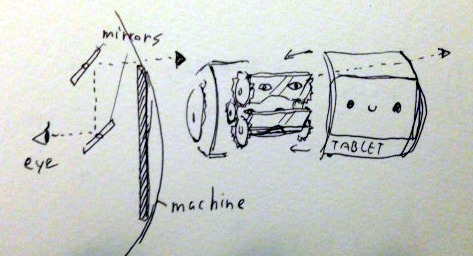 The solution is completely low-tech: two mirrors form a periscope whose angle can be adjusted by turning a knob on the side of the helmet. Version 1 of the helmet was started back in 2012; this is version 6 and [mocymo] is already filling out a to-do list for refinements. The nose area is uncomfortable, the angle of periscope is slightly off and the gearing needs to be reworked, among other things. We can’t wait to see Version 7. Video and gallery are embedded below. If you’ve been paying even a little bit of attention to popular music over the past couple of decades, then you’re surely aware of the electronic music duo Daft Punk. Of course, their success isn’t just a result of their music – a big part of it is also their iconic costumes and persona. What makes those costumes iconic is the robot helmets that the musicians wear. What initially began as a desire to hide their faces ended up becoming their most distinctive trait. The helmets that the duo wears have changed over the years, but an homage helmet created by [Mike Michelena] puts them all to shame. It maintains the aesthetic elements of Daft Punk’s helmets, while improving on the tech aspects in every way. 210 RGB LEDs, a microprocessor, and 14 amp hours worth of battery give it complete customizability and 5 hours of use.